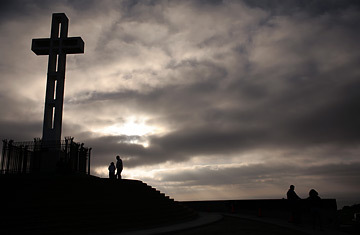 A 43-ft cross stands at the Mt. Soledad Veterans Memorial in San Diego. Is God dead? The three words represent a summons to reflect on the meaning of existence. No longer is the question the taunting jest of skeptics for whom unbelief is the test of wisdom and for whom Nietzsche is the prophet who gave the right answer a century ago. Even within Christianity, now confidently renewing itself in spirit as well as form, a small band of radical theologians has seriously argued that the churches must accept the fact of God's death, and get along without him. How does the issue differ from the age-old assertion that God does not and never did exist? Nietzsche's thesis was that striving, self-centered man had killed God, and that settled that. The current death-of-God group* believes that God is indeed absolutely dead, but proposes to carry on and write a theology without theos, without God. Less radical Christian thinkers hold that at the very least God in the image of man, God sitting in heaven, is dead, and—in the central task of religion today—they seek to imagine and define a God who can touch men's emotions and engage men's minds. If nothing else, the Christian atheists are waking the churches to the brutal reality that the basic premise of faith—the existence of a personal God, who created the world and sustains it with his love—is now subject to profound attack. "What is in question is God himself," warns German Theologian Heinz Zahrnt, "and the churches are fighting a hard defensive battle, fighting for every inch." "The basic theological problem today," says one thinker who has helped define it, Langdon Gilkey of the University of Chicago Divinity School, "is the reality of God." A Time of No Religion. Some Christians, of course, have long held that Nietzsche was not just a voice crying in the wilderness. Even before Nietzsche, SÖren Kierkegaard warned that "the day when Christianity and the world become friends, Christianity is done away with." During World War II, the anti-Nazi Lutheran martyr Dietrich Bonhoeffer wrote prophetically to a friend from his Berlin prison cell: "We are proceeding toward a time of no religion at all." For many, that time has arrived. Nearly one of every two men on earth lives in thralldom to a brand of totalitarianism that condemns religion as the opiate of the masses—which has stirred some to heroic defense of their faith but has also driven millions from any sense of God's existence. Millions more, in Africa, Asia and South America, seem destined to be born without any expectation of being summoned to the knowledge of the one God. Princeton Theologian Paul Ramsey observes that "ours is the first attempt in recorded history to build a culture upon the premise that God is dead." In the traditional citadels of Christendom, grey Gothic cathedrals stand empty, mute witnesses to a rejected faith. From the scrofulous hobos of Samuel Beckett to Antonioni's tired-blooded aristocrats, the anti-heroes of modern art endlessly suggest that waiting for God is futile, since life is without meaning. "It was easier for me to think of a world without a creator than of a creator loaded with all the contradictions of the world." But for others, the God issue—including whether or not he is dead—has been put aside as irrelevant. "Personally, I've never been confronted with the question of God," says one such politely indifferent atheist, Dr. Claude Lévi-Strauss, professor of social anthropology at the Collège de France. "I find it's perfectly possible to spend my life knowing that we will never explain the universe." Jesuit Theologian John Courtney Murray points to another variety of unbelief: the atheism of distraction, people who are just "too damn busy" to worry about God at all.